Dude!... Surf the Wave is a Dual-lane Commercial Grade Slip-n-Slide that will give your kids hours of aerobic activity as well as good clean fun. It is 30 feet long, 10.7 feet wide with an 8 foot wave curl. This unit features 2 lanes for “competition surfing” with a sloped speed surface that heads them directly to the wave backstop. Kids take a hard run and dive at the entrance, slide for 30 feet and experience the inevitable WIPE OUT! 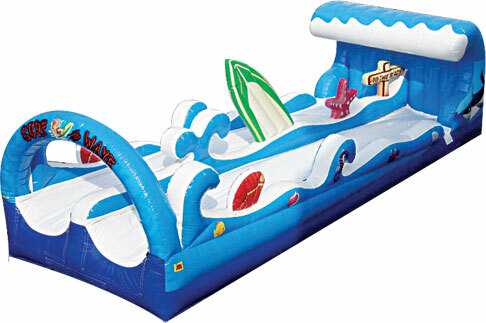 Surf’s UP this summer… in YOUR Backyard! Just How Many Kids Surf at a Time?